While driving in Malden, MA last week, I noticed something out of the corner of my eye – APOSTROPHE ABUSE! 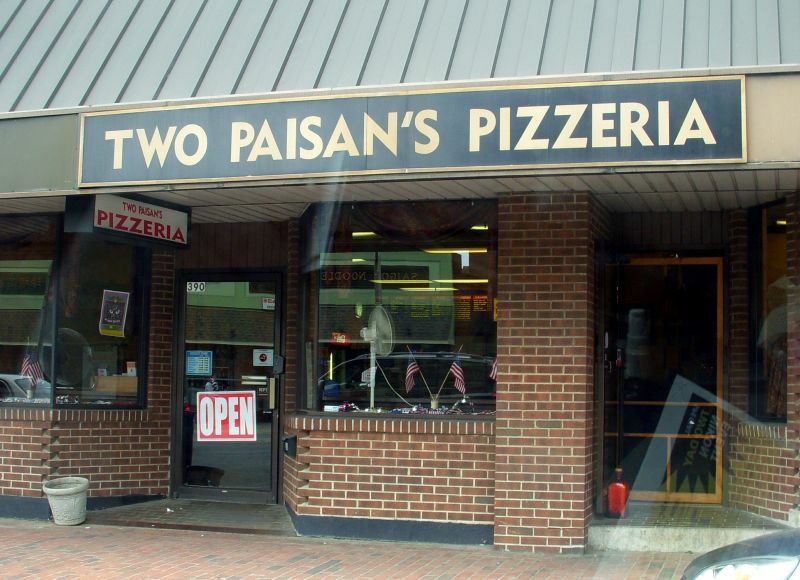 Please see the attached picture of Two Paisan’s Pizza in Malden MA. pointless discussion. “paisan” isn’t even a word. It’s a shortening of the Italian “paisano,” the plural of which is “paisanos.” Given that paisan is already a made up word, I see no reason why its plural cannot also be “paisan.” “Paisans” is no more “correct” because both are not proper English. I say that the sign is right. Or no more wrong than any of the other suggestions. the paisans could have the following: one paisan’s pizzaria or two paisans’ pizzaria. you can’t have singular plurality. I don’t understand how this is apostrophe abuse. This could be a pizzeria owned by two paisans… Or am I missing something?